Here is the long-awaited sequel to Doyle Brunson’s original Super/System — his acclaimed poker bible that launched the scientific poker revolution. Tips, tactics, and secrets from Brunson, the legendary poker champion, and his expert collaborators. Covers hold ’em (all-new limit advice with Jennifer Harman, plus no-limit), 7-stud high-low (Todd Brunson), Omaha high-low (Bobby Baldwin), Triple Draw (Daniel Negreanu), Pot-limit Omaha (high, Lyle Berman), online play, tournaments, and more. Contributions from Crandell Addington, Steve Zolotow, Johnny Chan. Plus 43 huge-profit tips explained by Mike Caro. 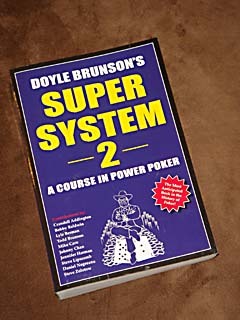 After 27 years, the legendary poker champion and hall of fame player, Doyle “Texas Dolly” Brunson finally releases the long-awaited sequel to his milestone Super/System. Once again, he personally selects world renowned experts to assist in educating and unleashing the next generation of poker winners. Covering new poker games, in addition to hold ‘em, this powerful new poker manual sets new standards for poker training. Brunson invades new territory and defines winning for the modern poker era. World-class poker superstar, Jennifer Harman, defines the most compelling limit hold ’em strategy ever made public. World champion Bobby Baldwin returns to provide big-money advice on Omaha high-low split (eight-or-better). Mike Caro contributes his favorite 43 tips that work in any kind of poker. Top pro Lyle Berman unravels the mysteries of pot-limit Omaha (high). World champion Daniel Negreanu shares his secrets on beating the new big-money game of triple draw. Important contributions from Johnny Chan, Crandell Addington, Steve Zolotow, Steven Lipscomb, and more. Electrifying world-class poker star, Todd Brunson, surrenders his secrets for demolishing any seven-card stud high-low table. And Doyle Brunson himself drives home successful tournament strategy and reprises and updates his acclaimed, proven no-limit hold ’em advice. Over 650 pages of dynamic poker tactics aimed squarely at beating today’s games. It was almost three decades between Doyle Brunson Super/Systems, but this profit-packed sequel was worth the wait!